We aim to seek out the best deals for New Zealand Cruise Lovers. Our combined Cruise experience has seen us cruise in New Zealand, South Pacific, Alaska, Mexico, Caribbean and Europe. Experiencing a diverse range of cruising from River Cruising in Europe to Small ship Cruising in Fiji to cruising from Auckland to South Hampton UK via the Panama – we are truly experts in our field. Apart from being Cruise Experts we are all qualified Travel Professionals, so can help with not just your cruise, but all aspects of your holiday – to make it a seamless experience. We have also had numerous walk around visits on a number of other ships. 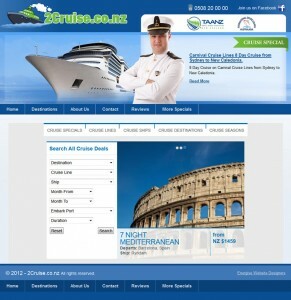 2 Cruise is the specialist cruise division of 2 Travel Ltd, which operates as Harvey World Travel Whangarei with retail premises at 30 Rathbone Street, Whangarei, New Zealand.